Screen sharing is a hugely useful feature you can build into a video chat. We recently saw how to capture the screen using Chrome. Support in only one browser is not much fun so you’ll be pleased to hear we can access screen capture in Firefox too. Let’s see how. It was not straightforward to implement screen capture for our own application with Chrome as we needed to build an extension. Firefox, on the other hand, has supported screen capture since version 33 using the mediaSource constraint in the mediaDevices API. However, before Firefox version 52 your site needed to be on a whitelist to access screen capture in Firefox. You can see who is on the whitelist by opening about:config in Firefox and searching for “screensharing”. Since Firefox version 52, this capability was made available to all sites that are served over HTTPS. You could build an extension that added your site to the whitelist, however as Firefox is up to version 56 as I write this, we won’t explore that within this post. This works slightly different to the Chrome example in which you could pass an array of potential sources, including “window”, “screen” or “tab”. In Firefox you can only request one mediaSource at a time from the choices “screen”, “window” or “application”. To explore how this all works in Firefox let’s build the same example application that we built for Chrome, capturing the screen then showing it in a <video> element. Create a new directory for this project as well as a file called index.html. All the work will be in the HTML for this example, so that is the only file you will need. Within the <script> tags we’ll start with some of the code we already had from the previous project. This code selects the video and button elements that we need to use, initialises a stream variable and sets up a listener to stop the stream when the “Stop screen” button is pressed. Now, when a user clicks on the “Get screen” button we’ll work out whether they want to share the screen, window, or application and then pass that to getUserMedia. Once we have access to the stream, we set it to the src of the video object, hide the get screen button, and show the stop screen button. If there’s an error we can log that in the catch function. And that is all the code we need! Let’s see it in action. If you have another method you use to serve static files on localhost you can use that too. 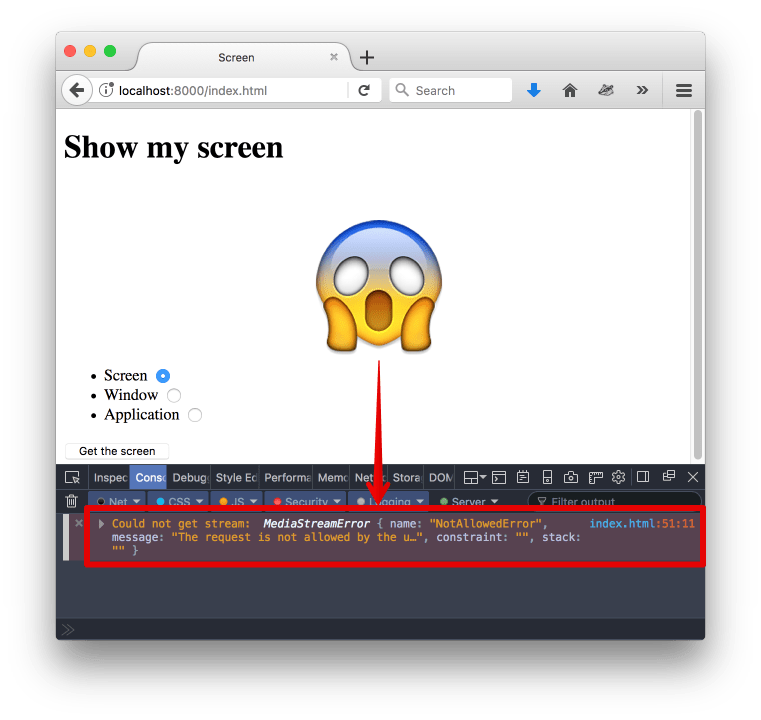 Firefox’s implementation of the mediaDevices API requires the site accessing screen capture to be served over HTTPS, even when served on localhost. Since we’re just loading the site over a regular HTTP connection we get an error. To workaround this locally you can generate a self signed TLS certificate and configure your local web server to use it to serve the site up over HTTPS. There’s an easier solution though. 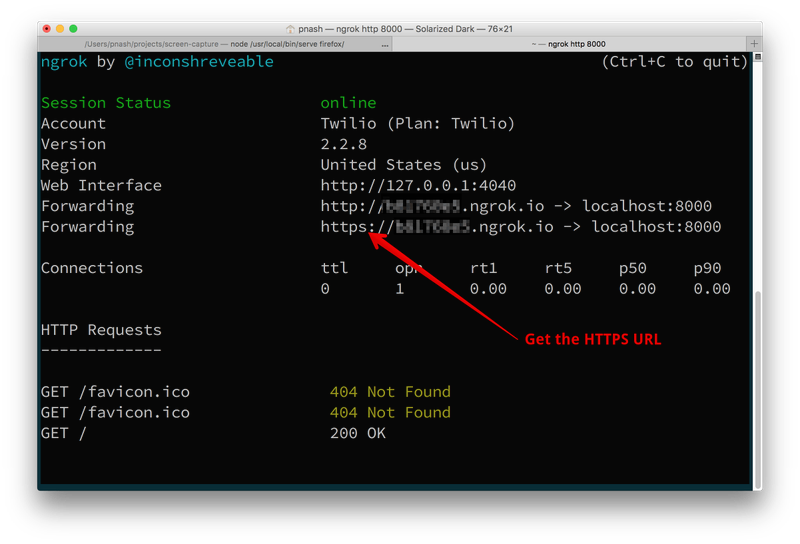 I normally like to use ngrok for testing webhooks locally, but it can also give you an HTTPS URL with which to test your application. Grab the HTTPS URL and enter that in Firefox instead. Now press the “Get screen” button and you’ll be able to give access to screen and see it in the <video> element on the page. You can also explore the results that “screen”, “window” and “application” give you when selecting the media you want to capture. Now we’ve seen screen capture in both Chrome and Firefox. If you want the code for both, check out the GitHub repo. Next up, we’ll look at using what we’ve seen in these two blog posts to build a screen sharing application using Twilio Video. Do you have an interesting use case for screen capture in browsers? Drop your ideas or any questions in the comments below. Or feel free to reach out on Twitter at @philnash or by email at philnash@twilio.com.